financial project support and assistance in raising capital. Our clients include large multinational corporations as well as privately owned companies looking for opportunities to enhance their business. The company is currently engaged in power development, wireless and emergency communications deployment, water development, international licensing agreements and project financing. JHS Associates focuses on clients where through our experience and relationships, we can offer strategic advice and provide significant comparative advantage. Our philosophy is to work closely with a limited number of clients to provide day-to-day support of their business strategy. This includes assistance on the financial structure of the firm, sales to private and public entities, licensing terms and agreements, acquisitions and other strategic partnerships. JHS Associates works with its clients to identify the best working relationship and will work on retainer, commission or as an equity participant in the venture. JHS Associates blends the unique experience and contacts of its principals with an attention and responsiveness found only at smaller companies. Clients will experience a partnership with integrity and independence. We have extensive and diverse relationships both within the United States and overseas. Our contacts range from the U.S. private sector to the public sector, from the state and local level to Washington, DC and the international arena. 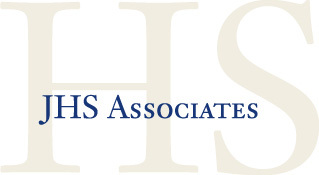 The firm’s experience within the private sector and government allows JHS Associates to understand the issues companies face within the private sector and how best to provide the strategic direction to help our clients succeed.